The Old Stone Mill in Delta Ontario is a National Historic Site showcasing milling technology and 1800s industrial heritage. 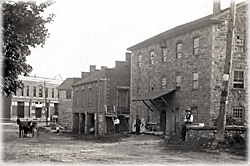 The mill was built in 1810 and is one of the finest examples of early industrial architecture in the region. The mill features interpretive displays, an operating waterwheel, millstones, bolter, grain elevators, and artifacts illustrating the grist milling process through the years. You can tour the mill yourself or enjoy a free guided tour. During the summer we grind heritage wheat into flour using our 200 year old millstones. Our stone ground flour is available in our small gift shop which also offers interesting mementos of your visit. We are a self-funded, volunteer based organization. Memberships and donations are our life blood. Please consider joining us and/or making a donation today. Open: Daily from Victoria Day Weekend (Saturday) through to Labour Day weekend (Monday) from 10:00 a.m. – 5:00 p.m. Thereafter by appointment only. Please pay us a visit soon - we know that you will enjoy it! We rely on the personal generosity of our volunteers to be able to maintain and showcase this remarkable example of Ontario history. We ALWAYS need more help. See our VOLUNTEER PAGE. Our newly renovated Old Town Hall is available for rent. It is perfect for any sort of gathering: weddings, dances, family reunions, conferences, theatre, banquets, art & craft show, or whatever. A commercial kitchen allows for food preparation on site. For more information see our Old Town Hall Rental Page. The Old Stone Mill and the Old Town Hall are owned and operated by The Delta Mill Society, a self-funded, non-profit organization run by volunteers. Accordingly, we have lots of people to thank for helping us get to where we are today. See our Thanks Page for full details. Visit the All About Our Stone Ground Flour section of this website for interesting information and videos of how the wheat we use is grown, how the grain is stone ground, how the ground flour is sorted, best uses for our flour and FREE BREAD RECIPES. 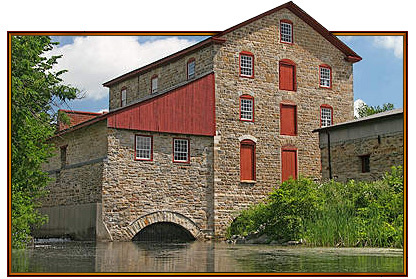 Our gift shop is located in the Old Stone Mill. Proceeds from sales go to maintenance and operation of the Old Stone Mill. New for 2018 - we can now accept credit and debit cards. For a sneak peek at what's available in gift shop - see our Gift Shop Page. We welcome cyclists travelling through Delta. If you haven't been our way we have several cycling tour descriptions (starting from the Old Stone Mill) available. See our Tours Page for information.